The NSA of the USA is systematically monitoring and collecting internet usage data. Thanks to the leaking of confidential documents by Edward Snowden about the PRISM program and other privacy invasions, the public is now aware of this. These systems work by tapping fibre optic cables and extracting data or by inserting government equipment into major internet companies infrastructure and accessing their data. This combination makes it incredibly difficult to keep your identity anonymous online. 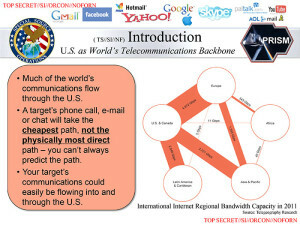 The PRISM program gives the US government access to the data in all Google products (such as Gmail and Youtube), Facebook, Hotmail, Yahoo, Apple, Skype, PalTalk and AOL. Therefore, do not use these products; or at least use them as little as possible. The problem here is that these companies work hard to offer great services so that you will use their products and they can advertise to you. A lot of people, for example, are locked into Google products such as Gmail. If this is the case, you need to treat your email like a public forum. Do not send confidential information using these services because they are compromised. There’s not much that can be done here. These mediums are convenient but compromised, you simply need to treat them with caution and not share all your secrets over them. Save that for face to face conversations. Regarding social networking, please do not use it. It is not the only way you can keep in touch with people. The use of social networks ties your digital self to your personal self. It makes you even easier to profile. Call people, email them, send letters, whatever. Of course you need to take note of what you are talking about no matter the medium. Chances are someone can read it or is reading it. The decisions you make about the software you use can better your privacy online. Try to stick to open source software. For instant messaging, use a client that supports Off-the-Record messaging. This provides strong encrpytion to the messages you send. For OS X use Adium and for Windows use Pidgin and OTR. Ensure to enable OTR messaging. For browsing, switch to Firefox and install Ghostery, NoScript, and AdBlock Plus. Firefox is open source unlike Google Chrome. An alternative is Chromium the open source browser that Google Chrome is built on. NoScript takes some getting used to but it is highly recommended for staying secure whilst browsing. It is also worth noting that Ghostery is owned by an advertising company. So ensure that you do not enable “GhostRank” which sends back anonymous data to Evidon. Finally, ensure that you install the EasyPrivacy list to AdBlock Plus. Install HTTPS Everywhere from the EFF. Now here is where you can be a little more certain that you are not being tracked if you follow these steps. A VPN encrypts your internet usage so that it cannot be snooped on. Please check out our article that explains in depth what a VPN is. Private Internet Access provide a VPN service that do not keep logs. They have eight non-US servers to choose from. When using the service you share an IP with other users therefore making it impossible to track a specific user. Funnily enough PIA run out of the US but this is purely because they do not have a mandatory data retention law. This makes Private Internet Access pretty bullet proof in hiding your identity. The main thing to be wary of is using personally identifiable services whilst logged in to the VPN. This ties down your identity to the usage of the VPN which should be avoided. Get more information in our VPN providers section. The goal here is to decouple your genuine online identity from various other ones. For example, if you use torrent sites, come up with a separate identity and only visit those sites using your VPN. Also, be sure to use a VPN provider that supports various server locations such as Private Internet Access. This makes it more difficult to track you. Use one identity for one region, one for another, etc. It is difficult to remember to switch on the VPN when visiting certain sites and to switch it off when checking your personal email. And it is obviously important to do this, however, depending on what you are doing online, a few mistakes here and there should be fine. If you are doing something nefarious then perhaps you shouldn’t be at home, you should be in an internet café. You should also not be doing anything illegal online, it’s evidently futile. These leaks have confirmed that your privacy online is fading away. Encryption helps but with direct access from the government to key internet players servers, this becomes moot. In spite of this fading privacy, you still need to fight back. You need to encrypt your data, you need to stop using these services where possible. Make the switch over to more privacy aware software and services. Also, tell your government to stop watching you.